I carried the tiny bundle in my arms, careful not to make any false move. I was carrying a fragile creature, my one and only godchild. It was his baptism, and the first time that I laid my eyes on him. I fell in love at first sight at the cuddly little boy. That was more than three years ago, but I still get awe-struck by the little guy. The first few months, were mostly goo-goo, ga-ga, that sort of lingo. I didn’t exactly know or understood what we were talking about, but I knew I once whispered in his ear, “Grow up already, baby boy!” See, I’m really fond of little kids, babies and tykes alike. And this guy, is no exception. 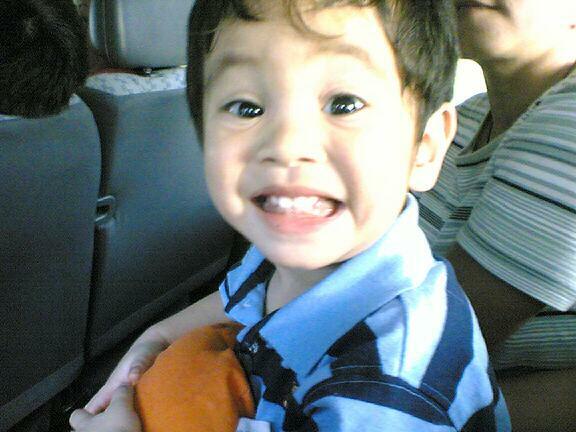 CJ Boi grew up to be a very pa-cute kid – not at all camera-shy (hmmm…asan ba magmana!?). Like any kid, he does have his quirks too - like climbing over grills and collecting cars ranging from match-box types to big toy cars, or singing the TeleTubbies theme song at the top of his lungs.